It’s primary calling card for five decades remains unchanged: the Toyota Corolla is comfortable and efficient. And for many car buyers, that’s been enough. It will have to be enough if you’re considering the 2018 Toyota Corolla. Virtually nothing has changed from a year ago for the ultra-popular compact sedan that is the highest selling automobile in history. Its popularity spans all ages, ranging from teens to retirees. Since 2009, every version of the Toyota Corolla has a 1.8-liter, four-cylinder engine. Most models produce132 horsepower and 128 pound-feet of torque. Eight years after it debuted in 1966, the Corolla became the top-selling car in 1974. Toyota announced that sales reached the 40-million mark in 2013. Now celebrating its 50-year anniversary, sales have exceeded the 43 million mark. The Corolla is known as the quintessential economy car – inexpensive, reliable, fuel-efficient and easy to drive. Despite its reputation, Corolla sales slid backward in 2017 when it suffered a 13-percent decrease. Is the competition catching up to the Toyota Corolla or is the Japanese automaker’s longtime cash cow slipping a bit? The guess here is it’s a little of both. The primary competition comes from the Honda Civic, Ford Focus, Hyundai Elantra and Mazda 3. The 2018 Toyota Corolla suffers in the performance category, although that’s really nothing new. It’s still good on gas (28-36 mpg), but so is much of the competition, including several rivals who offer better acceleration. Another negative is the Corolla interior features more cheap plastic than one might expect. In the Toyota lineup, the Corolla slots below the midsize Camry and above the subcompact Yaris. Although Toyota sells primarily the sedan version of the Corolla, it’s also available as a hatchback – the Corolla iM. The sedan has six trim levels (L, LE, LE Eco, SE, XSE and XLE). Since 2009, every version of the Corolla has a 1.8-liter, four-cylinder engine. Most models produce132 horsepower and 128 pound-feet of torque. The Corolla LE Eco has a little more performance, producing 140 horsepower and 126 pound-feet of torque. As mentioned, don’t expect quick acceleration from the Corolla, which has been clocked going 0-60 mph in a sluggish 9.5 seconds. To make matters worse, the engine also has a noticeable whine. The Corolla does offer solid handing, has a good safety record and is reliable. But overall, it’s a boring vehicle to drive. So, if you want more excitement, better shop elsewhere. Despite the overuse of hard plastic, Corolla interior possesses some fine qualities. Its controls are very straightforward, providing an intuitive nature that more vehicles should possess. There’s a 7-inch, high resolution touchscreen that’s very responsive. Overall, the Corolla technology is average, but we’re talking compact car – that’s what one can expect in this class. 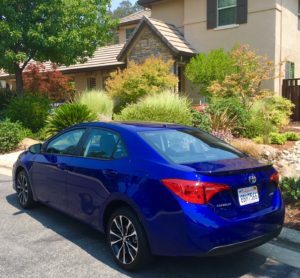 There’s lots of room in the Corolla, especially in the back seat where it feels more like a midsize sedan and leads all its rivals in leg space (41.4 inches). The driver and passenger also have solid comfort and room. The cargo space is 13.2 cubic-feet. While the Corolla remains one of the best buys in the compact class, perhaps it’s time for Toyota to consider a more powerful engine if it expects to remain on par with a group of capable rivals. Note that the 2019 Corolla is already on the market and very little has changed overall.